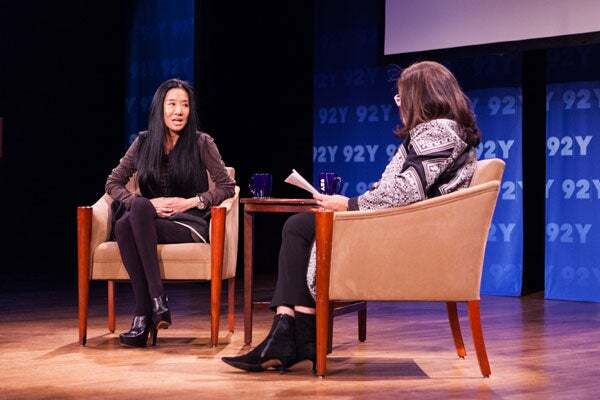 Queen Of Bridal Vera Wang's Advice On Love: "Don't Be A Fashion Nun"
No one quite knows how to interview like Fern Mallis. The woman who helped make Fashion Week what it is today not only knows her 92Y icons well, but she isn't afraid to cover touchy territory, like divorces, hardships, or other well-known fashion gossip that a less revered interviewer might be too shy to mention. So, her candid talk last night at the MARTINI Sparkling Wine-sponsored event with Vera Wang not only focused on Wang's much-publicized marriage, but the way in which her nuptials affected her career path. Wang worked at both Vogue and Calvin Klein, two prestigious institutions that tapped into her passion for her profession — so much so that she neglected her personal life. "Nobody believed I would ever get married. Not Calvin Klein, no one," she recalled. Yet, when Wang decided to part ways with Klein, he gave her a stern warning to cut the emphasis on work: "'Don't be a fashion nun. Don't be a fashion widow.' I told him I'd have to get married first in order to become a widow," she said. Yet, when she finally found the man she would marry, Wang couldn't settle on a wedding dress, so she had seven made. "I got a little carried away," she admits. Her father recommended that she start her own wedding business, and fiscally it made sense: No overhead, relatively similar materials, small clientele. However, there was one unforeseen obstacle. "There weren't often repeat customers. If someone got married in your dress and then gets divorced, they probably would want to throw you over a cliff," she joked. Even though her relationship with then husband Arthur Becker has ended, the two are still close. And Mallis decided to hit up Wang about the tabloid rumors of her post-divorce dalliance with figure skater Evan Lysacek. She immediately cheerfully chided Mallis, saying that she refused to get too personal. "I'm his mentor, I hope, for his ongoing life after sports." Does that mean she isn't a fashion nun? Too bad, because that sounds kind of fun, right?